Our son told us we had to try this place. He said it is some of the best food he's found anywhere in the area. He's right. This place is very impressive. The food is delicious. We tried the Spicy Korean box. I will be back many times! I had Bi-Bim-Bop. Taste really good with lot of veggies! Definitely, I would like to go back!! Only thing I thought was the atmosphere in the restaurant is not really like a restaurant and too casual. Love this place. The dumplings and Korean bbq chicken & beef are so good. Personally I liked the beef better. Will for sure be coming back here. We stumbled accros this nice family owned and opertated restaurant on our trip to the Woodlands food and wine show. Me and my friend we ate almost the whole menu, everything was super fresh, deliscious and very tastefull. The highlight was the Kimchi soup, spicy yet addictive!!! Mother and son cooked, and older son served the dishes.. Thank you Dosirak for a taste of Korea!! Fresh & Yummy! Try Dosirak - you'll like it! After seeing the wonderful reviews, we tried Dosirak. We have been back 4 times and Dosirak is in our schedule Good prices, fresh, satisfying food. Try the dumplings 10 for $5 and wow, they are yummy. If you are not an adventurous eater, try the bulgogi - it is BBQ beef with onion and rice. It has a nice, sweet sauce. 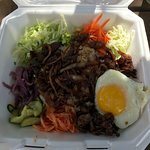 I love the bibimbab - it is rice with fresh veggies, your choice of bbq beef or pork and an egg on top. You mix it up and add sesame oil and maybe sriracha for a little heat. YUM!. The Kimchee is tasty and fresh. Dear daughter loves the bento style box, while Youngest son loves the ramen. What we enjoy most of all is seeing the American dream in action - Mom and Son - making wonderful fresh, homemade food in a family owned restaurant. Been to Dosirak Korean Cafe? Share your experiences!